These days, customers are searching for organizations that are not afraid to say what they stand for and deliver it with integrity. It’s a Way Not a Day will help you be one of those organizations. 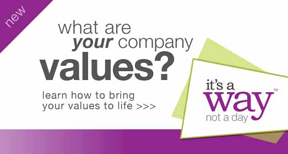 Effective organizations don’t just put their values into a document, they put their values into action. When you tell customers what you stand for, they expect it of you—and you expect it of yourself. What are you willing to publicly proclaim? An effective team consistently lives the values it says it believes in. Your values define who you want to be and point you to behaviours that help you achieve that goal. When you celebrate each other for living your shared values, it strengthens relationships and reinforces what you are trying to achieve. Customers know what to expect from you, increasing accountability and performance. Teammates know what to expect from each other, increasing trust. People feel appreciated for their efforts, increasing passion and commitment.